The Supreme Court on Thursday discussed an appeal of the disqualification of Arab Knesset Member Hanin Zoabi (Balad). A panel of nine justices presided over by Supreme Court President Asher Grunish discussed the motion. Soon after the hearing ended a violent riot broke out outside the court room. Right-wing activists including MK Michael Ben Ari shouted "Go to Syria" at Arab activists and tried to approach Zoabi. The Arabs in response accused the right-wingers of being racists. Security guards tried to restore order. 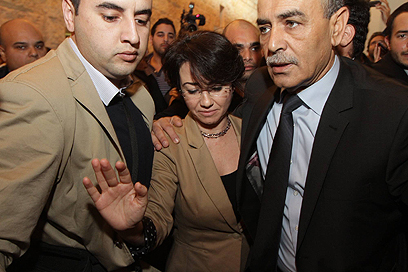 MKs Zoabi and Balad chairman Jamal Zahalka were quickly ushered into one of the court rooms. Prior to the hearing Zoabi said, "I expect the court to overturn the decision. I did not break any law, there is no basis for disqualification. The court should try racists instead. To disqualify me would be to disqualify all Arab citizens." Last week, the Central Elections Committee voted to ban Zoabi from the upcoming elections. Nineteen committee members voted in favor of disqualifying Zoabi, nine opposed and one member abstained. A representative of the Central Elections Committee defended the decision stressing that there had been due process and discounted Zoabi's claim of discrimination. "The committee makes its decisions based on evidence," she said. "MK Zoabi was never convicted of any charge, was never indicted, and never uttered a racist word," Zoabi's attorney's claimed. They pointed to the fact that Zoabi, out of all Knesset candidates, was the only MK to be disqualified "based on 4-5 quotes most of which are untrue and inaccurate and all of which are irrelevant." In a deposition filed with the court, Zoabi said that her disqualification "is another step in the process of demonization I have been subjected to since my participation in the flotilla. "All of the claims regarding the flotilla are false, there had been no complaint made against be by the soldiers who took part in the Marmara raid." See all talkbacks "Riot breaks out after Zoabi hearing "